It’s not often that I do things just for fun. I write to share lessons, to gain self-awareness, and sometimes just because I feel like I owe it to myself. Fun isn’t really a factor. When I was blogging regularly with 1 + 4 = Life posts, recipe round-ups, and #TellAllTuesdays, it felt more like a job than anything else. Reading is part of my bedtime routine goal – I try to get in at least a few pages every night. Sometimes it happens, sometimes it doesn’t. One would think that this is a great way to wind-down, take my mind off of stresses and decompress. Until you see the current stack of books that I’m working through: The Happiness Equation by Neil Pasricha, Smoke Gets in Your Eyes & Other Lessons From The Crematorium by Caitlin Doughty, The Fruit Hunters by Adam Leith Gollner, and Speaking Out Louder by Jack Layton. Sure, there are a few works of fiction in my pile, novels for pure entertainment, but most are for self-improvement. What can I read that will teach me something? That will make me a better person? That will show me how to be happier, more successful, or self-loving. Let me tell you, I have even found a way to make knitting a chore! How many pieces can I complete so that I can make a large donation to the Warming Room in the fall? To Do List: make all the things, learn to crochet, get really good, make a granny square afghan, learn to knit socks, and more, and more, and more. This is not to say that I don’t enjoy writing. I love it. I really enjoy sharing my life with you guys. I also really enjoy reading and knitting. But I always have a motivator and it is usually never just to let go and have fun. I had a Reiki treatment a few years ago from Alison Rodriguez of Healing Heart Reiki and Forgiveness. One of the things I remember her telling me is that I have tightness in my legs. She told me to dance more. Be carefree. Joyful. I spent some time recently reflecting on what Alison had said. I think a lot of the energy that she could feel in my legs stems from fear. The same fear that I’ve challenged myself to address this month. I hold things in my legs because I want to feel grounded; to feel in control even when life around me seems to be going out of control. I want to feel strong. Steadfast. Powerful. Mature. When you spend all your time trying to be these things, it doesn’t leave a lot of room for fun. It doesn’t leave room for silliness. It doesn’t leave room for dancing. I had a dream last week. I don’t remember a lot of it, but I do remember that it was a large family gathering – my family, which is strange because we don’t do those kinds of things. Cousins were there that I haven’t seen in decades. My brother and sister-in-law were there. And my grandma was there. My grandma died back in 2010, and have found myself thinking about her a lot lately. I also spend quite a bit of time stressing about having children soon so that they can have more quality time with their grandparents than I did growing up. In my dream, we were all out front of my parents’ house, posing in small groups for photos. And there was my grandma, dangling between Chad and I with her arms wrapped around our necks. She was laughing and swinging her feet up in the air. She was full of joy. And despite the grey hair indicative of her later years, her face was youthful. She seemed so young. I shared this dream with my mum and a few days later she said that she had been thinking about it quite a bit. She said that she believes my grandma was sending me a message. She was trying to tell me that I need to to not take life so seriously. It’s almost scary the parallels that happen when life is really trying to send you a message. The 30 Days of Brave Challenge, the recent reflection about the Reiki treatment, my dream, and my mother’s words. I need to experience life’s joys just for the sake of being joyful. Not because it’s on my to-do list. And not because it’s what my self-help book says I need to do. But because I deserve to do things with no other agenda than because they make me happy. I’m going to dance more. I always wondered how people could write poetry about butterflies and sunshine. How did they think to take time to reflect on dew drops, and the cautious graze of deer in the meadow? And why? Writing has always been an outlet for me to say things that I otherwise couldn’t say aloud. My prose are of heartbreak and loss, life lessons, and determination. I couldn’t quite grasp how to write for fun. You may never read it, but along with dancing, I’m going to try to let my creativity spirit run wild when I write. Maybe I’ll end up with some pure gold, filled with dewdrops and butterflies, too. 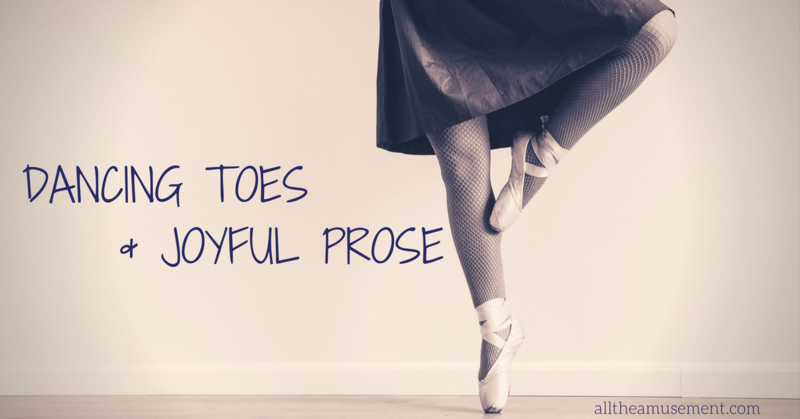 If all you can muster is a tapping toe, do that. Take the paint set out and channel your inner child. Do something just for fun. But don’t get so caught up in life that you forget that you’re actually supposed to enjoy it.